The Prankster analyses the submissions by ParkingEye's counsel, Jonathan Kirk QC. The Prankster has never been to the Supreme Court before and concludes from what he has seen that the job of a QC is to misrepresent the true situation, attempt to justify conclusions without any basis in fact, and to present partial information when the the whole gives a completely different picture. The Prankster imagines how it would have gone if ParkingEye had employed Jim Carrey from the file Liar, Liar. MR KIRK: My Lord, can I start by, forgive me, dealing with the structural questions which is whether this is effectively a contractual term or a matter of breach. I would prefer to deal with that in writing. Redefining the charge as contractual would potentially bankrupt ParkingEye. Contractual charges attract VAT, whereas charges for breach of contract do not. ParkingEye states at the initial hearing they make a 7% profit. VAT will turn that into a 13% loss, backdated to when they started, and with financial penalties. Therefore it is not likely either party would welcome the contract being re-interpreted. In any case the Unfair Terms in Consumer Contract Regulations 1999, regulation 7 provides that if a term is ambiguous, it is to be resolved in favour of the consumer. If of the best legal brains in the country cannot immediately agree on the nature of the contract, the term is clearly ambiguous. MR KIRK: And deal with the other questions that arise as a consequence, but I accept that, if it is rightly construed as a term of the contract, that the penalties doctrine has no application and it is likely, subject to the question of intelligibility to fall outside the exception for the adequacy of price in relation to the regulations. Can I start with our position in relation to the doctrine of penalties. We don't ask the court to overrule the penalties doctrine and we obviously approach it on the basis of the more flexible approach reflected in the Court of Appeal's judgment. And in relation to that, it is important to consider the two words "Extravagant" and "Unconscionable" words that are perhaps not in modern usage. It has been expressed that this is not really the language of 21st century English. The question, the first question to address is how were they used in the main case that we have considered from which they came? So, that is Clydebank. If I could ask your Lordships to turn in the main authorities bundle, A, to divider 5, which is the Clydebank case, 851. LORD NEUBERGER: You will appreciate that we have looked at this more than once in the past few days. LORD NEUBERGER: Unconscionable and extravagant, 851, yes. MR KIRK: At 851 we are dealing with the Lord Chancellor's speech. He uses "Unconscionable and extravagant" in the middle paragraph, "Extravagant or unconscionable" in the next paragraph, "Unconscionable or not" in the paragraph after that. And it is clear, if we turn forward to page 858, in the speech of Lord Davey and I will read this passage: "But of course the question whether it is exorbitant or unconscionable is to be considered with reference to the point of time at which the stipulation is made between the parties. That is to say you are to consider whether it is extravagant, exorbitant or unconscionable." I think at some point he goes on to say it doesn't matter which word. LORD CARNWATH: The following words: "Whatever word you would like to select." MR KIRK: I am obliged. The question arises, whether you are going to assess whether a term meets a particular test. What does that test really mean? The word extravagant in ordinary English usage, we say, means something akin to far more than is necessary. The word exorbitant, manifestly or grossly excessive mean effectively the same thing. That much is not so difficult to determine from the case law. The question really is what is meant by unconscionable? Not a modern word. How do we address the meaning of unconscionable in the 21st century? So, I would ask that your Lordships turn back to the First National Bank case and to the very famous test of Lord Bingham. Which is found at 7127 in bundle H. It is only where Lord Bingham looks back at good faith, and it is the passage in within the highlighted text that reads: "Good faith in this context is not an artificial or technical concept, nor since Lord Mansfield was its champion is it a concept wholly unfamiliar to British lawyers. It looks to good standards of commercial mortality and practice." We say that, effectively, that is what is meant here. We say that if you combine extravagant and unconscionable, you are really looking at one concept. That is effectively this question: was the amount so large that you would not be acting in good faith to make somebody pay it? In relation to that question, the test is really one which you have to consider all of the relevant circumstances. There are two approaches that have developed or there is one approach that has developed since the Dunlop case. The rigid mechanical approach as it was referred to by Professor Baron and that approach seemed to have, seemed to predominant to sues that word again, up until the commercial justification cases. Our submission is that in relation to the origin of the doctrine, you need to look at when the amount is extravagant and unconscionable and in relation to that to consider all of the relevant circumstances, not simply the question of whether the stipulated amount is greater than the recoverable loss in any particular. The value question here, the battle ground here, in relation to this particular contract is whether, when you have a situation where there is no recoverable loss, there can ever be, the stipulated amount that is not a penalty. So, the question that arises at the forefront of all of this is whether there can ever be a situation where other interests, non-financial interests, or whether financial interests that are indirect, are sufficient to allow the clause to stand. As the Court of Appeal pointed out, this problem can be easily resolved, and there would therefore be no need to change the law. ParkingEye could have in their contract with the landowner a clause which penalises them if overstays occur. This then creates an initial recoverable loss, to which they could add the costs of recovering that loss. MR KIRK: There are four potential interests here: the first is the company, the respondent's companies' interest in keeping their contract. An interesting conjecture, which surely fails the test of remoteness. There have been no known instances where ParkingEye have been sacked for failing to collect parking charges. There have been plenty of cases where ParkingEye have been sacked for over aggressive collection, including ParkingEye v Somerfield, where the landowner had to cough up £300,000 for the privilege of ditching ParkingEye. MR KIRK: The second is their reputation, if they allow people to abuse the car park, et cetera. But of course ParkingEye enforce using ANPR at this car park. There is no manned patrol. There is therefore nothing to stop people parking over marked lines or parking in disabled bays without blue badges. Why would their reputation suffer for one type of contravention but not another? MR KIRK: Then there are two which are more remote. There is the potential landowner's interest, despite the fact that we accept that he is not privy to the contract between the parking company and the consumer. In the original trial hearing there were two defendants - Beavis and Wardley. The landowner asked ParkingEye to cancel Mr Wardley's ticket but they refused. There is therefore no evidence that the landowner wants all charges enforced. On the contrary, ParkingEye appear to be acting in defiance of the landowner's best interests. And the fourth, which is, I suppose, the most remote is the overarching interest of people who use the car park, who are obviously third parties, the public, the public interest. There is no evidence the public benefit from the parking regulations. They may of course, but this is just conjecture. There is an almost identical car park in Bristol, owned by the same landowner, managed by the same agent, also serving a retail park. It is also in the centre of town, a similar distance from the station. This car park is free and has no regulations. Yet there are no parking problems and always plenty of free spaces. The landowner tried to introduce ANPR and a maximum stay but the retailers rejected this as it would be bad for business. An equally valid analysis of the situation, given the lack of evidence submitted by either side, is that the cameras are introduced as a clever way to monetise a free car park, gneerate £1000 a week for the landowner and more for the parking company. This would be to the detriment of motorists and retailers. The question that arises in this case is whether those interests are justification for the imposition of a stipulated amount that is not extravagant or unconscionable. No one is arguing that car park management is not needed in all cases. However, there has been no evidence submitted it was needed in this case. And the level of charge we will see later is clearly extravagant to that actually needed. LORD NEUBERGER: Is that a convenient moment? MR KIRK: It is my Lord. LORD NEUBERGER: Thank you very much. We will resume again at 2.00 pm. The court is now adjourned. MR KIRK: My Lords, can I start now by looking at one of the factors that we say is important under both your consideration of the penalties doctrine and also in relation to unfair terms, that is the policy behind the legislation. It has been a matter of discussion earlier. I am now looking back at the Protection of Freedoms Act which is in consumer authorities bundle J, divider 4, and 7309 in the electronic bundle. LORD NEUBERGER: What page, I beg your pardon? LORD NEUBERGER: Thank you very much. I have it, yes. MR KIRK: And we can see that chapter 2, "Vehicles left on land", is the second chapter in part 3, which is entitled protection of property from disproportionate enforcement action. If I ask them that we turn to the criminal offence, which is at 7315, section 54. MR KIRK: It is not only made an offence to immobilise or clamp a motor vehicle, but it is made an offence to remove or restrict the movement of such a vehicle by any means. So effectively, a private landowner cannot clamp, cannot tow, cannot move a motor vehicle. LORD NEUBERGER: Yes, we have the point. MR KIRK: There is an exception for barrier car parks in section 54.3, but that is not the point I need to make at this stage. MR KIRK: If we turn over the page to sections 55 and 56. MR KIRK: They are described as alternative remedies in relation to vehicles left on land. Section 55 provides an extension of what were police and local authority powers to remove vehicles from public land and it extends that right over private land. So, effectively the police and/or local authority and several other public bodies have a residual right to remove vehicles that are dangerously parked. MR KIRK: The point we make is this, and it is a very simple one, whether you frame the parking charge in contractual terms, whether it is framed in breach of contract, whether it is framed in trespass, if you are only entitled to charge the market rate for car parking, then that will simply not deter. This is of course, is not true. The parking company can use a contractual term to set a market rate which will deter. This is well-established in other car parks which have a graded charge so the hourly rate becomes more expensive the longer you stay. There are two nearby car parks, a council car park and a private car park which charge around £5 a day to park. Thus, a rate of free parking for 2 hours but £10 a day after that will drive the desired consumer behaviour. ParkingEye themselves use this model at service stations, where they charge nothing for 2 hours, then around £12 a day after that. If that works for them in those car parks, why is ParkingEye arguing it does not work in this car park. Similarly with breach of contract; if ParkingEye were able to establish an initial loss (see earlier for how they could easily do that), then their average enforcement costs per ticket issued were established in the trial hearing as £18 ticket. This amount would be a genuine pre-estimate of loss and therefore not a penalty - as we have just seen, this is more than enough to drive consumer behaviour. And so, you can glean from that, we say, the policy behind this was to replace a system of self-help with a system of charging for parking in a way that is unauthorised. LORD MANCE: Why do you assume that this scheme is intended to promote deterrent schemes of parking? The government guidance to the scheme expects that the charge would be limited to a genuine pre-estimate of loss. "Charges for breaking a parking contract must be reasonable and a genuine preestimate of loss"
MR KIRK: Because, my Lord, if you were limited to charging the rate that, for example, the multistory nearby charge, so a rate that you might expect to pay in a city centre, and that was the limit, you could do no more, then everybody's private land would be the subject of, effectively, a right to park where you could park and simply pay a small market rate for doing so. This is of course, untrue. Different car parks can charge different rates, and these can be manipulated to drive consumer behaviour. A large range of strategies are available to manage car parks which this blasé statement simply ignores. That cannot have been the policy behind this legislation. If it was the policy then it would have been very easy for Parliament to stipulate that. And indeed, they did make their intentions clear in the guidelines, as seen earlier. Since then, they have reiterated their position, both in regard to parking at hospitals, and rogue parking operators in general. So, we say that whatever the mechanism, that policy is a factor that ought to be considered when one considers all of the circumstances under both penalties and under the regulations. Can I turn to the regulations now. I want to make my submissions by reference structurally to seven questions that arise. They arise both under the regulations and under the penalties doctrine. I want to compare and contrast those seven points. I should say that the 1999 regulations have or are soon to be replaced by the provisions in the Consumer Rights Act, although they are not yet in force and the wording has changed very slightly, particularly in relation to the definition of core terms. But I am going to come to that in due course. I am going to work, in fact, rather than taking the domestic implementation provisions, from the directive if that assists. That directive can be found in the same divider at 7301. LORD NEUBERGER: Thank you. Yes. LORD CARNWATH: Article 3 is not dealing with imbalance between the parties, it is dealing with imbalance between the terms, as my Lord, Lord Sumption, pointed out earlier on. LORD SUMPTION: The imbalance has to be caused by the terms once they have been agreed. I mean, it may not make a great deal of difference, because if the obligation to pay the £85 is simply the result of a free choice, made by the motorists, his options are not being constricted by the circumstances or the conduct of the landowner, or ParkingEye, then it is hard to regard it as arising from any imbalance. MR KIRK: I suppose that is the same or a different way of saying that you consider the terms, you consider the relationship when you consider the terms. So, I suppose I am not really saying anything that is different. What I hoped to do was to show the difference in approach between imperial tobacco and Lord Radcliffe's approach in Bridge, so if I can take your Lordships to bundle A, this is divider 3. Page 819. LORD TOULSON: A, I am sorry. MR KIRK: Campbell Discount v Bridge, which is a hire purchase arrangement. I think the facts have been dealt with, but the contract as a whole would now fall foul of the Consumer Credit Act, but Lord Radcliffe said, and this is at the end of his judgment: "I do not speculate as to what principles they would have thought applicable to a hire purchase contract in which the hirer, I dare say willingly enough, transacts only with the dealer who is not the agent of the owner and if he signs up at all, signs up to an elaborate fixed menu of stipulations and conditions, which he probably does not bother himself to read and very likely does not or cannot understand." Our submission is that what that shows is that as a factor in considering the doctrine of penalties, the courts were willing to consider the relationship between the parties. The third point of comparison is a question of whether you consider good faith unconscionability. LORD MANCE: Has anybody ever done a study as to how many of these £85 penalty charges arise from very limited overstays? I mean, I don't know what supermarkets or shops there are here, but if you get caught in a supermarket queue, and you are two minutes over the two hours, you presumably get the parking charge and I imagine you feel quite upset. It is not just the relationship between parking ParkingEye and the consumer, it is all the relationships involved in going to a retail park like this, isn't it? This happened to me. Went over by 4 minutes, went on holiday and by time I got back was over £100. Had used that car park 4 times over 3 months, never seen anything stating what the 'penalties' are. Never been back to that car park or the shops around it. Stockton-on-Tees needs the business but tough, taken my custom elsewhere. MR KIRK: The nature of the shops was considered during the course of the trial. MR KIRK: These are not supermarkets, these are shops -- there is a shoe shop, a Mothercare, there are shops where you would probably not expect to spend a great deal of time there. Blatantly not true. There are plenty of shops on site where a great deal of time would be spent. When the BBC visited the site to investigate, only two retailers was in favour of the time limit.The others were either neutral or stated it harmed their business. There are 12 retail units on site, with two new ones being fitted out for Dreams Ltd, and Costa Coffee. The shop managers were asked two questions: a) Have you had many customer complaints about the 2-hour parking limit; and b) Does Parking Eye's enforcement of the 2 hours help or hinder your business? 1 was the Nuffield Health Gym, where their customers get 4 hours if they log their registration number. The manageress at Matalan was particularly vociferous, saying that she could spend all day trying to get charges cancelled, but now she just refers them all to Savills. The PoundStretcher lady said she has actually had customers abandon their trolley mid-shop, because the 2 hours was nearly up. Many of them said that once customers get hit with a PE parking charge, they usually never return to that site again. Incidentally, directly opposite is a Council car park, which charges £1.20 an hour. A lot of points have been taken during the course of this hearing that were not factually addressed during the course of the earlier hearings and, in particular, at trial. If that question of one minute, two minutes overstaying had been raised then I would have taken the court to a point that arises -- I will just pass up the British Parking Association code, which is the additional document, it is page 10. There are, as a requirement -- I think it is putting it too high to say a regulatory requirement -- but a requirement of the membership of the approved organisation, the government approved organisation you must have, allow, a reasonable time for people to come in and out. So, nobody is charged, if the system is applied correctly, for staying less than two hours. Nobody is charged for staying less than two hours, agreed. People are charged for staying small amounts over that time, and of course, as POPLA pointed out in their recent annual report, motorists can be trapped in a car park due congestion, which is quite a common occurrence. The Prankster has helped many people who complained to ParkingEye they were trapped in the car park, but ParkingEye refused to cancel the charge. LORD TOULSON: You mentioned evidence. What evidence was there before the court? We don't have it, do we? MR KIRK: There was evidence from ParkingEye, a witness statement from ParkingEye, which set out the manner in which this operated. MR KIRK: There was evidence from Mr Beavis, the defendant, which concerned a global approach to parking. LORD TOULSON: Did the evidence from ParkingEye explain the rationale of the calculation which would have led to the £85? Although there was no evidence pre-hearing, in the witness stand Alex Cooke for ParkingEye stated that the charge was set by visiting other car parks and seeing what penalties they charged. LORD SUMPTION: Was the operating scheme, that we have just been referred to, before the court? MR KIRK: Yes, it was put before the court and in particular reliance was placed on it by the appellant. LORD MANCE: What does it have to do with the contract? It is not referred to, is it? It is not a contractual document. MR KIRK: No, it is not a contractual document. LORD MANCE: Is it referred to? I don't think it is referred to. LORD MANCE: But as far as the contract is concerned, it is the document we have, and clause 13, which may or may not be easy to apply to this contract, isn't contractual. LORD SUMPTION: It is only evidence of what might happen in practice, not what must have happened. MR KIRK: The issue of short staying was not raised. LORD MANCE: I was not actually addressing short staying, I was addressing short overstay. And what is a reasonable period? We don't know. MR KIRK: There was no evidence about that. I do know but I am going to resist that temptation. I should add, though, that we have made submissions about how this area of industry is regulated and I am not going to repeat those submissions. But, this code which effectively binds these operators, because if they don't sign up to it they cannot have access to the information that allows them to run their business, the identities of motorists, is a code that is arrived at if your Lordships look at the foreword on the second page, it is the last paragraph. 19.5 If the parking charge that the driver is being asked to pay is for a breach of contract or act of trespass, this charge must be based on the genuine pre-estimate of loss that you suffer. We would not expect this amount to be more than £100. If the charge is more than this, operators must be able to justify the amount in advance. As ParkingEye ignored this requirement for years without any penalty despite a multitude of complaints to the DVLA and BPA, the code is hardly binding. As Captain Barbarossa might say, "The code is more what you call guidelines than actual rules." The DVLA have confirmed in FoI statements that they do not require operators to follow the code and they will still hand out keeper details even if parking companies do not toe the line. It is this: "I would like to thank those that contributed to this updated code. In particular the members of the advisory panel which include representatives of from both the operators and consumer and motoring organisations including the AA, Citizen's Advice Bureau, Consumer Focus, the RAC Foundation and Disabled Motoring UK." It was a clever strategy to mention these names, but the Prankster doubts these bodies have much control over the final document. In any case, these were apparently only consulted for the first version, not version 2 which was in force at the time. The DVLA have admitted in FoI requests that they have had no input to the code since the first version. However, even if they had, if you compare the BPA Code of Practice to the dogs breakfast that is the IPC, it is clear there is no control. The IPC do not let keepers appeal windscreen tickets, even though that was a clear requirement of the government. So, it is a document that is designed in some ways to balance the interests of both consumers and motorists. This is not a valid conclusion. In particular, these bodies seem to have no control over the level of parking charges, which is the issue in hand. One of the parking terms that we have not considered in any detail was the parking term in relation to disabled bays. That is a requirement under this code, which I should just flag up before I leave it, which is at page 10.16, "Disabled motorists". It refers in general terms to obligations under the Equalities Act. This is another clever ploy to make it seem like ParkingEye are considering the interests of disabled motorists. However of course this car park is managed only by ANPR cameras at entrance and exit; there is no manual patrol. There is therefore no regulation of disabled bays and disabled drivers have to take pot luck that nobody has taken their spaces. Rather than respecting the Equalities Act, this would therefore be good grounds for taking action against ParkingEye and the landowner. But we can see, really, if you have obligations in relation to disabled motoring, it would seem highly unlikely that they could be described in anything other than deterrent terms. You are not saying to somebody, "However you construe the contract you may park in a disabled bay", you are saying, "Don't park in a disabled bay". This is a valid point, and explains why the charge must be for breach of contract and not a contractual charge. There can be no valid offer for able bodies people to park in disabled bays. This of course blows away the contractual model recommended by Will Hurley and John Davies of Gladstones Solicitors (and also of the IPC). Can I then put that to one side and then return to my questions. Do you consider good faith? I have already answered that in relation to penalties before the short adjournment and the answer is in a limited way, you don't really consider it in the same way that you would consider illegality or something of that nature. Under the regulations, you do consider good faith and we have been through that. The points that we would make about this particular term are those that we have set out in our case. But, the challenge, the challenge that has been made to it relates not so much to the term as to the business model. We question whether the unfair terms doctrine is the appropriate mechanism through which to make such a challenge, because there is another mechanism that is open to organisations such as the Consumer Association, that would allow them to consider the commercial practice involved here. If I could ask your Lordships to turn in consumer authorities bundle J to 7295, it is the Consumer Protection from Unfair Trading Regulations, 2008. 7295, J, divider 2. This is the primary legislation that allows regulators such as local authority trading standards departments and the Consumers' Association to take action against unfair commercial practices. At this point The Prankster notes that all the ParkingEye employees in court turn green and look as if they very much wish their counsel would shut up. Commercial practices is defined very broadly. The legislation which implements the European directive, the unfair commercial practices directive, sets out all of the potentially unfair commercial practices and I am not going to go through in detail but just in summary, they are numerous. The prohibition of commercial practice contravenes the requirements of professional diligence and if you turn to 7296, you will see how broad a test this is: "Professional diligence means the standard of special skill and care which the trader may reasonably be expected to exercise towards consumers, which is commensurate with either honest market practice in the traders' field of activity or the general field of good faith in the trader's field of activity." Misleading actions: "A commercial practice that contains false information and is therefore untruthful in relation to any one of a number of matters." Again a commercial practice that could be challenged under this legislation. Perhaps the most important is the broadest of the commercial practices that can be challenged using this legislation, misleading omissions. Commercial practices and misleading omissions is at 7299. If in its factual context, taking account of various matters, it omits material information, it hides material information, it provides material information in the manner which is unclear, unintelligible, unambiguous and/or timely. And this: "The commercial practice fails to identify its commercial intent unless this is already apparent from the context." Although the business model put forward it to deter overstays, there was no evidence put forward to support this model, and in fact and equally valid point of view is that the intent of the business model is to generate revenue; £1,000 a week for the landowner and an unspecified amount for ParkingEye. (ParkingEye v Somerfield (eg para 576) reveals they expect to issue around 0.4 Parking charges per space per week. In this context ParkingEye are clearly failing to identify their true commercial intent. 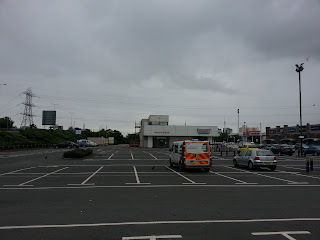 At Avonsmead retail park, a similar car park, even though there is no parking problem the landowner tried to install ANPR against the wishes of the retailers. However, this leads to the conclusion that the true intent is not to deter all overstayers, but only overstayers who are not customers. The motorists who park and go off to the train station are not welcome, but shoppers who spend a great deal of time and money on site, are. But this is simply misleading, and against consumer legislation. Why should a shopper who paid cash and lost their receipt be penalised, while a shopper who uses their bank card is not. Why should a shopper who spends £29.99 be penalised while a shopper who spends £30 is not? Consumers have the right to know these hidden terms and conditions so that they can make sure they keep receipts, use bank cards, or 'spend a penny' if needed. So, although in a business to business relationship there is great scope for redrafting clauses, it is not quite so easy in a consumer context where you have to be frank about what your commercial intent is. Quite. But ParkingEye are clearly not coming clean, either with the signage, or with their behaviour in court by not giving the Supreme Court, the highest court in the land, the full picture. But the point we make here is that if you are challenging a business model, it is not sufficient to simply go under the unfair terms and challenge the unfair term, because what you are really considering is the commercial practice. What they are really saying here is that it is wrong for a business such as this to make profit from parking in the way that they do on this breach model. NHS organisations should act against rogue contractors in line with the relevant codes of practice where applicable. LORD CARNWATH: You could have said that in the Ashbourne case, couldn't you? MR KIRK: The Ashbourne case is a classic example of how the office of fair trading, as it was, went and used both the unfair commercial practices directive under part 8 of the Enterprise Act and their rights under the unfair terms legislation, to consider a whole host of bad practices. LORD CARNWATH: But they succeeded under the unfair terms, didn't they, in relation to the misuse as it was seen of the customer's propensity to be overoptimistic; do you say that was wrong? MR KIRK: I don't say that was wrong, but I am saying in this case, it is not so much the term that is the problem. Because if you take out the parking company, you put the landowner there, then it doesn't seem to be an issue. It is the model, it is the way in which they make their profit. That, we suggest, is more susceptible to challenge on the basis of commercial practice rather than unfair term. The same problem would occur if the landowner ran the car park directly. In that scenario, the problem that there is no initial loss goes away, but the issue with the level of charge remains. The landowner would be able to charge a genuine pre-estimate of loss, which co-incidentally would be roughly the same as the charges that council car parks impose (by analysing industry figures). They would not be able to charge the penal rates of £85 (or elsewhere £100 or even £120). LORD HODGE: So, you say in relation to the challenge that we are facing here, we should assess it as if the landowner were doing that which you do, in effect? MR KIRK: Yes. Yes. I want to be careful that I am not accepting something with which I might find hidden trap. LORD HODGE: There wasn't intended to be. MR KIRK: Your Lordships showed an interest in the core terms. To the extent that this is a case in which, certainly for the purposes of my submissions now, we work on the basis of breach. It has been accepted that a default provision does not fall within the core terms and that is primarily based upon the rationale of the decision in First National Bank. First National Bank, obviously, involved default interest payment after judgment. I suppose the distinction that there might be between First National Bank and the Abbey National case is that in the Abbey National case it was not found to be a matter of breach, a question of breach, it was found to be a question of a term. So, you could then legitimately go on to consider whether it fell within the exception. Your Lordships expressed an interest, I was merely going to take you to the various tests, if that would be useful, but I don't need to, because of the position or the submissions that I am making. LORD CLARKE: The test for what? MR KIRK: The tests in relation to core terms. LORD CARNWATH: That is not an expression one finds in the regulation. LORD TOULSON: 4.4 is the regular provision in the regulation, isn't it, in the directive? Sorry, we are on the directive. MR KIRK: Yes. I should say that the language has changed in the Consumer Rights Act. And so: "The exclusion from the assessment of fairness, a term of a consumer contract may not be assessed for fairness under section 62 to the extent that it specifies the main subject matter of the contract or [and these are the key words] the assessment is of the appropriateness of the price payable under the contract by comparison with the goods." Et cetera. LORD NEUBERGER: Where do we find that? MR KIRK: I don't think these provisions have been handed up. LORD MANCE: It is a new Act coming in. Don't worry then. LORD HODGE: The only major difference between 6.2 of the regulation and what you have read out is the emphasis on appropriateness rather than adequacy. LORD TOULSON: I was just turning that up now because what you have just read out had a rather familiar ring to it. It may be from the bill attached to the unfair terms in contracts report, but anyway it matters not. MR KIRK: We couldn't find the suggestion in the law commission report for the change to the word "Appropriateness", but there is some reference, if it assists your Lordship, in the explanatory notes at 301 to 303, which in summary say that adequate was not a particularly clear word to use and remuneration added nothing. LORD TOULSON: Anyway, these are yet to be introduced provisions? MR KIRK: Yes and as I understand it there is no starting point. The only two further matters that I need to address your Lordships upon -- or I do not need to -- are two questions that arose during the first case. LORD CARNWATH: Before you do that, are you going to say anything about the Aziz test? Is that one of the ones you are covering; whether you could reasonable assume that the consumer would have agreed to such term in the individual contract notion? MR KIRK: Yes, and the judge had in mind what Lord Millett said in the First National Bank, the trial judge had in mind that test. That is one of the factors you consider. You would in this situation, of course, consider whether the consumer would accept this. But in this case, this was actually very clear that this was a consumer who had used the car park on several occasions, that was the evidence during the course of the trial. It seemed very difficult to say in those circumstances, when you have a term that you knew perfectly well applied, and he repeatedly used the car park, as many others did, that there could be any real basis for saying that he wouldn't have used it had he known or wouldn't have use it had he realised. LORD MANCE: That is not quite the same. Would have agreed to in individual contract negotiations postulates, a blank sheet of paper and them sitting down either side of a table and one of them saying, "Now, this is what I want", and the other then having an opportunity to comment; driving into a retail facility and everything going well the first few times, seems to me a different kettle of fish. LORD SUMPTION: If you assume that there is a difference between what the motorist actually agreed to and what he would have agreed to in a negotiated contract, then you must surely also be assuming that in some way the situation is such that the motorists choices are contradicted. Otherwise, it is difficult to see why there should be a difference; why would he not park someone else where ex hypothesis the charges were lower or different or whatever? So, doesn't it ultimately boil down to the question, whether the consumer's choices have been in any way constricted either by the conduct of the other party or by the circumstances in which they find themselves? MR KIRK: Yes. I am not sure I could argue with that. The whole rationale for European consumer law and, perhaps, a rationale that we can find in our own common law, is not to make decisions for consumers or protect them from their bad decisions, it is so that consumers can make informed decisions where they are not taken advantage of. This is a situation where it would be very difficult to say that a consumer was being taken advantage of when the signage was so clear and in accordance with what you might ordinarily expect. Another obvious fallacy. The customer is being taken advantage of because they have no bargaining power. The test is, if they had bargaining power, would the contract be different? LORD TOULSON: They are two different matters, aren't they? There is the requirement for clarity and understanding, core terms, even core terms have to pass that test. A quite separate matter is the substance of it. And of course, if people are presented with the contract of adhesion and everybody in the market is following the same term, then the customer has no choice wherever he goes, but the Aziz postulate is looking at it in a rather different way. Which is if you were starting with a blank sheet of paper and if you were in a position to influence this term, whether it is something where your lawyer would say, "Well, hang on, this is not right, this needs some justification". MR KIRK: Yes, I suppose the justification in this situation is the fact that this is a free car park where you get two hours free, you balance that against the risk that you might overstay and be found to have to pay the £85 or £50, in fact. Which leads us back to the fact that as the loss is £0 (and the indirect loss £18), this is an unenforceable penalty. LORD MANCE: Going back to the context, we are told in the statement of facts and issues, this car park is located adjacent to Chelmsford railway station in a retail park. Without having been to Chelmsford for many decades, I would wager a pretty fair bet that you would be most unlikely to be able to park free near Chelmsford railway station, outside this. LORD NEUBERGER: Being a wager it is definitely unenforceable. LORD MANCE: Can one take judicial notice of that sort of consideration. LORD NEUBERGER: We just have. And in fact there are two nearby car parks where parking is £5 for all day parking. Therefore the deterrence level needed would be something like £10 to drive consumer behaviour to park elsewhere. ParkingEye use this model at motorway service stations where there is 2 hours of free parking, but around £12 per day after that. As this model works in motorways, there is no reason why it cannot work here. LORD MANCE: Everyone will park there for free. LORD NEUBERGER: Lord Mance must be right, must he not? Seriously, we all know there are areas around the country, near shopping centres, where parking is a very desirable feature. Near a railway station, even more so and you normally have to pay for the first hour as well as subsequent ones. LORD TOULSON: My difficulty with all this is it comes back to the point you indicated earlier that before the court, there was no evidence to explain the rationale of the £85 or how it was arrived at in relation to this car park. One rather suspects it may be that ParkingEye has a standard rate and that is what it has in all its car parks. That may be right and may be wrong, but the fact is that we are all now engaging in our own speculations as to what might be a justification of £85 at this particular location, aren't we? An extremely good point and Lord Toulson hits the nail on the head. This is all speculation and no good evidence is provided by either side. And of course the reason for this is that the case started in the small claims court for a random claim in a random car park, and so the rules of evidence were such that hardly anything was submitted. A large numbers of small claims cases against ParkingEye motorists have asked for evidence to be provided or witnesses to be present for cross-examiniation (ParkingEye regularly give false information in witness statements, and a number of these are on file, including the iniital witness statement for the very first Beavis hearing). Almost invariably judges have ruled agains thses requests stating it is against the ethos of the small claims court. LORD TOULSON: The only material I get from the first instance judgment he had was, a comparison with local authority parking rates and the company's balance sheet. LORD TOULSON: That was it. MR KIRK: That was it. MR KIRK: There was general evidence about what their costs were and how they were attributed the lion's share in fact to the administration and installation of the operating system. But there was no detailed analysis, primarily because we were not saying that the breach caused a particular loss. If there had been that approach then I accept that it would have been appropriate to deal with each of the items in detail. In the first hearing the costs were argued to be an average of £18 per ticket issued, which was calculated by dividing the total business costs from the accounts, by the number of tickets issued (obtained by FoI from the DVLA). Although this exact figure was not mentioned in the judgment, HHJ Moloney did confirm the charge was in no way a genuine pre-estimate of loss. My Lord, those are my submissions, unless I can assist your Lordships further. LORD TOULSON: Can I ask one question, I think we were told that the regulations referred to in the contractual document are simply what is on the face of the document. MR KIRK: Yes, your Lordship is right. LORD TOULSON: Parked within marked bays, do I understand that correctly, that somebody parks and is not squarely within a marked bay, that gives rise to a £85 charge. No. The site is managed by ANPR cameras and so there is no possibility of detecting this type of violation. However, this does beg the question; if a motorist parks over a line, or in a disabled bay without a blue badge, they are breaching the contract but there is no possibility of them getting a parking charge. Presumably then, the landowner is accepting the fact that the deterrent element is in the signage alone. No actual charge is needed. But if no actual charge is needed for these types of transgressions, why is a charge needed for overstays? If a deterrent of £0 is sufficient in some cases, why is a deterrent of £85 needed in others? If ParkingEye is at risk of losing their contract if they do not enforce overstays, why are they not at risk for not enforcing parking in bays and in disabled spaces. LORD SUMPTION: Presumably on the basis that you are effectively occupying the space of two cars. LORD TOULSON: You might not be, I mean one is not allowed to give evidence, but you have a sort of car park where one moves slightly and all the cars along the line are all slightly over the white line, you get 10 of those that is rather good for ParkingEye because you have 10 times £85. The end result is, 10 cars still park, no harm is done to anyone, and as ParkingEye do not enforce this kind of breach, no charges are issued. MR KIRK: My Lord, I am not going to give evidence, but it was not an issue that was raised. LORD TOULSON: It wasn't, but we are looking -- no, all right. Thank you. MR KIRK: I am conscious that I don't want to overstay. Because it will cost me £85? LORD NEUBERGER: Thank you very much, Mr Kirk. Mr de Waal. *Ignore the fact the link says version 3. It is version 2. Several law firms have today released an identical piece of churnalism where an unnamed person or persons have analysed the Beavis case and deemed that it is not likely that the Supreme Court will find for Mr Beavis. Biscoes, Tgbaynes and Wheelers are among the law firms releasing the piece. Here is the text of the piece, which is identical on all sites. Many thousands of drivers who have been subject to a parking charge of 100 times or more the normal hourly rate will be displeased to read that a plucky appeal against a massive 'charge' for overstaying in a free car park has failed. The motorist who brought the case was charged £85 for overstaying in a car park and brought a small claims court action against the company that levied the charge. The motorist's claim was based on the argument that the charge was so disproportionate as to be properly regarded as a penalty. Penalty clauses are not enforceable in British law. However, the Court of Appeal ruled that the charge had been set at a level to deter overstaying and it was not 'grossly disproportionate'. These factors meant it could not be regarded as a penalty. This decision will come as a disappointment to the thousands of motorists who have been subject to charges on this sort of scale – often as a result of short overstays or ignorance that parking charges were payable. Unless the case is successfully appealed to the Supreme Court (which seems unlikely), the likelihood that such a charge can be successfully resisted is clearly diminished. No doubt the 7 Supreme Court judges involved can now rest happy knowing that their decision has already been taken for them. How much should parking companies pay for issuing invalid tickets? Parking companies regularly issue tickets for such minor transgressions as parking on a white line or overstaying by as little as one minute. They also issue huge numbers of tickets when no transgression has taken place at all. The Prankster has reported on large numbers of incidents where motorists have visited car parks twice, but been issued tickets for one long stay. The prankster has over 10 such tickets himself. Usually it is very difficult for the motorist to prove their innocence; The Prankster takes photographs of his vehicle elsewhere if he is visiting a car park twice in one day. One motorist was lucky because they had a tracking device in their car. ParkingEye did not back down at first, but did once they learned of the tracker. The Pranksters brother got accused when a camera was partially obscured by a leaf. The scale of the problem is huge. ParkingEye admit in court documents that 60% of their tickets are not valid and have to be cancelled on appeal. Of the remaining 40% POPLA cancel 47% of those appealed according to their latest annual report. Of the charges where POPLA dismiss the appeal a further percentage are still not valid - POPLA can only rule on issues which the motorist raised. ParkingEye have cancelled a number of tickets when The Prankster got involved, despite having won at POPLA. Of course, the parking companies are hoping motorists will just pay up and will not appeal. By issuing tickets like confetti they scare large numbers of people into paying up. The 40% discount for early payment is especially designed to do this. Large numbers of people who contact the Prankster say they want to appeal but are scared to because if they lose the price will increase. The 40% discount was decided in a meeting of the parking companies in June 2012. The meeting minutes record that the purpose was to 'discourage frivolous appeals' but The Prankster considers a more proper description is to discourage appeals full-stop. Given the trivial nature of the transgressions which get penalised for up to £120, how much should parking companies be charged for issuing false tickets? The Prankster proposes that a fair amount would be the amount they are asking for. If the parking company cancels a charge on first appeal, they pay the motorist nothing. If the motorist then appeals to POPLA with the same reasons and POPLA uphold the appeal, they pay the motorist the full charge. This would discourage parking companies from issuing frivolous tickets in the hopes that motorists will not appeal. This thread on pepipoo documents a motorist victimised by Meteor Parking. He has received 5 tickets in 4 weeks for not displaying a ticket - all invalid because he pays by phone. Some are further invalid because the warden is so incompetent they cannot even get the registration correct. Given the huge number of invalid tickets issued, the Prankster calls on the BPA to redress the balance and put some kind of deterrent in place to curb the tide. Making the parking companies liable for their own mistakes seems like the obvious solution. 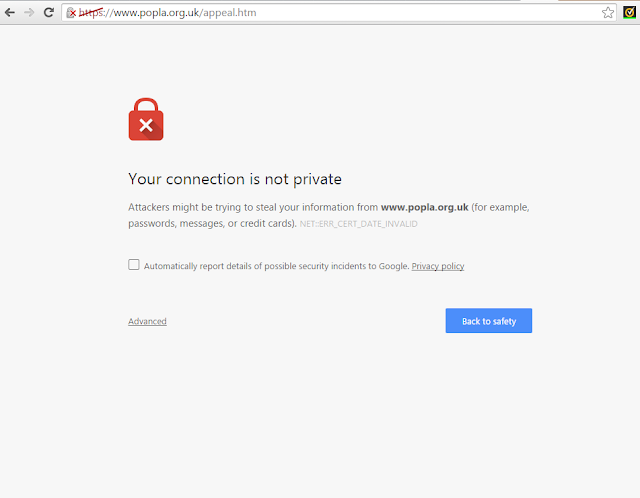 Currently the POPLA website is down. Although the main site can be accessed, appeals cannot be made. Presumably this is because the sites security certificate has expired. Please ensure you quote the 10 digit verification code, the PCN number and vehicle registration along with details of the appeal. POPLA do not normally allow email appeals so please do not use email once the website is fixed. Henry Greenslade has released POPLA's 2015 report, the last one under the auspices of London Councils - next year POPLA transfers to the Ombudsman services. Although Mr Greenslade and The Prankster have had their differences, on the whole they do see eye to eye on many issues. Obviously this does not stop The Prankster calling Mr Greenslade out from time to time, or Mr Greenslade getting his digs back in the annual report. It is worth pointing out that if you do not have an independent person of high integrity like Mr Greenslade overseeing an appeals service, what you end up with is the IPC- a disgrace to the industry. The adjudicators are hand picked by solicitors from Gladstones, John Davies and Will Hurley, and the appeals service is structured in a way by John and Will that demonstrably makes it almost impossible for an appeal to succeed. It is no coincidence that Gladstones Solicitors have filed large numbers of court claims last year on behalf of parking companies. As John Davies and Will Hurley directly financially benefit from this, it does call the integrity of the IPC into question. It is no surprise that the IPC do not dare release an annual report. The Prankster has seen a number of IPC appeal results and concludes that the adjudicators have poor knowledge of the law regarding parking, poor knowledge of consumer law, and poor reasoning skills. The Prankster's opinion is that any assessor who is prepared to follow the rules the IPC imposes is not ethically fit to be a solicitor and should serious consider the morals of what they are doing. The POPLA report shows that the number of successful appeals has risen from to 45% to 52%. One reason for this may be the rise of appeals companies who have an almost 100% record in winning POPLA appeals. As most parking charges are not legally issued for one reason or another, the appeals companies can get almost all charges cancelled. However, POPLA requires the appeal to be correctly structured and will not look themselves for a reason to cancel the charge - the motorist has to know what points to raise. Mr Greenslade especially thanks the Senior Assessors, Shehla Pirwany and Christopher Adamson, The Prankster echoes that thanks and commends their sensible and consistent approach to assessments. Mr Greenslade analyses the ParkingEye v Beavis case, and concurs with The Prankster that the verdict did little to improve clarity around parking charges, and that the verdict might not cover charges in fee-paying car parks. As the level of charges imposed by local authorities is £25/£50 in most areas of the UK outside London, the verdict would not seem to be the silver bullet the parking companies hoped for. Mr Greenslade warns about appeals companies. Although there are genuine appeals companies there have also been some fly-by-night ones which spring up, take money, and then disappear again. Mr Greenslade refers to the continuing practice of operators to reject appeals without supplying a POPLA code. The Prankster considers that the operators have had enough time to get used to the rules; any operator continuing this practice should have the appeal automatically upheld. The Prankster contrasts this with the 'kangaroo court' run by the IPC, where the opposite is presumed. The Prankster considers there is no greater indication than an assessor is biased against the motorist that when they off their own bat quote 'Elliot v Loake' as justification that the keeper was the driver. The Prankster expects parking companies to quote this case, but any competent assessor should be able to identify this is not a relevant case. The lesson to be learnt from this case is that if the owner lies that their vehicle was parked at home all night, but forensic evidence places it at the scene of a crash, that if they also state they had the only keys with them all night, but were not the driver, then they are also likely to be lying about that. In other words, the common legal principle that if you lie in court, all of your statements are likely to be disbelieved. it is certainly a basic principle of a fair appeals service that each party is given the opportunity to see the other party’s case and to comment upon it. The Prankster points out that the appeals service run by the IPC is therefore certainly not fair because only the operator gets to see the motorists evidence and comment on it. The motorist does not get to see the operator evidence or comment on it. The IPC has recently made a small change to their procedures, and since April 2015 motorists have been allowed to see the operator evidence, but only after the appeal is over. The Prankster has seen that from information he has been provided with, operators regularly lie to the assessors and are allowed to get away with it. This backs up the BBC Watchdog program, which also revealed that IPC operators lie during appeals. Mr Greenslade analyses grace periods and reasons why a one size fits all policy is not appropriate. This is consistent with POPLAs approach; in the past POPLA have allowed an appeal for an elderly motorist at the Range who took a long time to park and get the store doors, find it was closed and then leave. Mr Greenslade gave examples of the deplorable behaviour of some parking companies at hospitals. The Prankster will run a separate blog on this issue. Unlike parking companies, The Prankster considers life threatening situations a good reason to override parking restrictions. Mr Greenslade points out some of the problems with ANPR systems The Prankster believes the main trouble is the refusal by the operators to admit that ANPR is fallible. Three operators were reported for sharp practices; ANPR and T R Luckins for trying to put motorists off appealing, and ParkingEye for delaying for months for no reason before rejecting appeals. A number of operators won no appeals at POPLA. One operator won all appeals. The appeal of Mr Beavis has now been held at the Supreme Court. The case regards a charge of £85 ParkingEye imposed on Mr Beavis for overstaying when he had problems at Staples (a shop on site); Staples took a lot longer to print than expected. This was the fifth hearing regarding the case as it has wended its way through the legal system. The hearing was held in conjunction with Cavendish Square Holding BV v Talal El Makdessi, which also involves the enforceability of penalty clauses in contracts. Makdessi took the first two days of the hearing; the parking case occupied the last day. Their Lordships threw an immediate curve-ball at Mr Beavis's counsel, John de Waal QC. They could not agree whether the charge was in fact for breach of contract at all, but might be a contractual charge, in which case the doctrine of penalties did not apply. There might even have been no contract at all (as Mr Foster pointed out in hearing number 3), but just a licence to park. This threw Mr de Waal who took some time to recover, but came back to get his points in once their Lordships moved on to those areas which were listed as the ones to consider. The Consumer Association representative Christopher Butcher QC was next and he was very strong, putting his points across forcefully. Jonathan Kirk QC then had 15 minutes on behalf of ParkingEye before lunch. After lunch he continued, before Mr de Waal and Mr Butcher had a brief rebuttal. Due to the 'off-piste' nature of the original questioning, their Lordships took the unusual step of allowing written arguments on the point of Contractual Charge, to be delivered next week. Respnses were allowed, but strongly discouraged. The final judgment is not expected to be handed down before October. The Prankster will have a fuller analysis in due course. The Prankster has received a report of yet another tourist being scammed at Changegate Howarth car park. This is to bring to your notice a very unpleasant experience I had at change gate car park situated opposite the Edinburgh woolen mills store in Howarth, West yorkshire on 21 July 2015. I am a visitor from Canada on trip to the Yorkshire Dales with my wife. We entered the above mentioned car park to shop at the store across the street on 21 July 2015. I had to make a phone call so my wife went ahead and I stayed back in the car to make my phone call. I finished my call in 4 minutes and came out to buy a ticket from the pay machine. A man in a high visibility jacket was standing next to the car and told me that he is giving me a parking charge of 100 pounds as I did not have a pay and display ticket!I was shocked to hear that and explained the situation to him.He was not ready to listen and continued writing on his pad and taking a photo of my car! He handed me the notice and said that if I paid the charge straight away to him it would be reduced from the 100 pounds to 60 pounds. I explained to him that this is unfair and outrageous but he kept on saying that I should pay the 60 pounds and then write to yourself for a refund. Otherwise the car rental company (my car is a rental) will get the notice and I will have to pay the entire amount.I proceeded to buy a parking ticket from the machine and joined my wife in the store.Me and my wife were very upset by these events and decided to pay upfront as we were quite shaken by this episode. In fact our nice vacation time in England has been left with an unpleasant memory.I think this is unfair and I would have not written to you if there was any legitimate ground for issuing me a charge. The situation is that this car park is unregulated and the operator is not a member of an Associated Trade Association (ATA) such as the British Parking Association. There is therefore no genuine appeals process, and the motorist could not for instance, appeal to POPLA on the ground that a grace period is required before issuing tickets. More importantly, as the operator is not a member of an ATA, their only chance of getting payment is on the day. The operator cannot contact the DVLA and get the address of the vehicle keeper (the hire company) and there is therefore no keeper liability. Only the driver could be pursued, so the only opportunity, since their address in Canada was not known, would be to take money on the day. Sadly, the operator knows that this car park is visited by many tourists who would have no knowledge of the legal situation and could be scammed into paying money on the day by the old 'pay now and get a discount' trick. They would also not be aware that a grace period of 5-10 minutes is generally acceptable as the time allowed to purchase a ticket, and so a period of 4 minutes would be acceptable. ParkingEye's argument is that without them there to issue parking charges at much higher levels than council charges, chaos would ensure; motorists would be unable to park; the car park would be full of commuters; retailers would suffer. They therefore argue there is a social need for them to pay the landowner £1,000 a week so that they can issue parking charges. They have never provided any evidence to back this up, so The Prankster decided to investigate the matter. 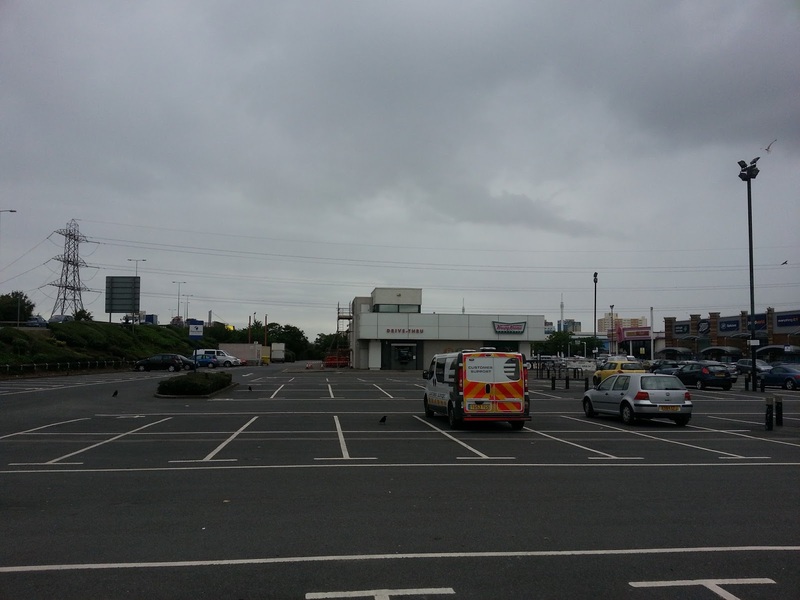 The ParkingEye v Beavis case concerns Riverside Retail car park, Chelmsford, a car park owned by British Airways Pension Fund, managed by Savilles, and sited in the centre of town close to a rail station. The car park allows parking for free for two hours. After that, the motorist must leave. The Prankster found a similar car park, Avonsmeads Retail Park in Bristol (BS2 0UG). The car park is owned by British Airways Pension Fund, managed by Savilles, and sited in the centre of Bristol 500m from Bristol Temple Meads rail station. The car park allows unlimited parking with no restrictions whatsoever. The Prankster decided to investigate to see if parking chaos was rife at this car park. An initial perusal suggested otherwise. There were plenty of free spaces. Determined to get to the bottom of the matter The Prankster visited the the establishments on the retail site and asked questions of the store managers. Costa Coffee stated they never had a parking problem. "There are plenty of spaces as you can see." They never had a customer complaint about parking. The Cinema manager declined to comment, but perhaps looked pointedly at the huge amount of available parking. The Hollywood bowl stated there were no problems even at weekends and busy times. They informed The Prankster that Savilles wanted to put cameras in with a 2-3 hour limit a while back. The retailers had all pushed back because it would have hurt their businesses. The bowling alley, cinema Costa Coffee, McDonald's and Greggs all opposed the cameras and so manage to get Savilles to change their mind. Krispy Kreme said there was no problem. They might get a lorry driver sleeping at 11pm when the car park was otherwise empty but they were always gone in morning. They would oppose any time limit. The only problem The Prankster identified that was there were "boy racer" meets every few months. Of course, that is not solved by cameras. The retailers use security to move them on. So to summarise; a similar car park is in a similar position owned by the same people and managed by the same agents. Parking is free with no limit and no enforcement at all. Despite there being no space problems the landowner tried to enforce a camera regime of 2-3 hours, presumably so they could trouser £1,000 a week. This was robustly resisted by the retailers because it would have hurt their business. None of the retailers thought there was a problem which needed fixing, even though occasional users (eg sleeping lorry drivers) may not be customers. Even at the busiest times there are no problems. No retailers reported complaints from customers. Carmageddon has not ensued. There is a specific problem with the occasional boy racer meeting, but this cannot be solved by ANPR. Instead it is solved by security moving them on. Before the Protection of Freedoms Act 2012 the parking industry was causing a lot of government concern due to rogue clamping operations. Parking charges were whatever the clampers could get away with and ticketing was no better, with a maximum recommended charge of £150. The government decided to stop rogue clampers; the parking industry replied that there would then be no protection for landowners - as only the driver was liable, everybody would just deny being the driver. The government agreed to make keepers liable for parking charges, as long as more regulation was introduced. The British Parking Association tightened up their code of practice, and one aspect was to decide just how large a parking charge they could get away with. This was decided in a meeting on 6th June 2012 which is online here. As is evident from the minutes, although lip service was paid to the requirement that a charge for breach of contract "must be a genuine pre-estimate of loss" (P4), the three factors for recommending a £100 cap (P7) were nothing to do with actual costs. A mandatory early payment discount of 40% was required in order to "discourage frivolous appeals" (p4); again, nothing to do with actual costs. A large number of operator comments (P9, P10) showed that in many cases parking charge levels had nothing to do with actual costs. Charges for breaking a parking contract must be reasonable and a genuine preestimate of loss. This means charges must compensate the landholder only for the loss they are likely to suffer because the parking contract has been broken. For example, to cover the unpaid charges and the administrative costs associated with issuing the ticket to recover the charges. Charges may not be set at higher levels than necessary to recover business losses and the intention should not be to penalise the driver. The British Parking Association Code of Practice agreed with this. you suffer. We would not expect this amount to be more than £100. If the charge is more than this, operators must be able to justify the amount in advance. The big problem was that few parking operators had actually set charges by assessing their genuine pre-estimate of loss - many had just set them to the maximum level they thought they could get away with. POPLA, the independent appeals body, provided a sharp wake up call to the parking industry when motorists started contesting parking charges. As the operators could not justify the charge levels, the appeals were upheld. Of course, as there was no loss to them at all, the appeal was upheld. It would be a long time before they would admit there was no loss to them again - the ParkingEye v Beavis case. ParkingEye's document did continue a trend though - one of lying to POPLA and the courts. The attempt to pretend Rheidol Retail park suffered any loss whatsoever from shoppers overstaying was a blatant lie which has never been backed by any evidence whatsoever. ParkingEye's other attempt to justify their charge was to pretend that their costs per ticket issued were rather large. They also seemed to be unaware of exactly how much their costs were - in Barry Beavis's case ParkingEye at various times claimed their costs were both £53 and £55. An analysis of ParkingEye's accounts showed that ParkingEye were regularly perjuring themselves in court. Their costs could not possibly be that much. Their average cost per ticket issued could be a maximum of £18, and was probably much less. Despite their lies, ParkingEye's charges were still rejected by POPLA because they never provided a breakdown of their costs - of course, this was because their costs did not add up to the charge and so they could not. Instead, their document justifying their charges grew from a 5 page document into an 8 page filibuster by May 2014, containing filleted extracts from court cases they had won (remember, in all of these cases they perjured themselves by lying to the court) and fictitious statements, such as their charges had been approved by the DVLA and the Office of Fair Trading. FoI requests to those bodies revealed that ParkingEye were perjuring themselves once again. ParkingEye also lied in that they made a loss on some charges if they were paid at a discount. It is difficult to see how they could keep a straight face when stating they made a loss if they were paid £50, when the costs incurred were a £2.50 DVLA fee, and 50p postage. Only one paragraph of the filibuster was relevant, in that it actually detailed their heads of cost. POPLA routinely upheld appeals, because these heads were not related to the costs incurred by an actual breach, and in any case, the levels of costs were not provided. ParkingEye were not the only parking company with this problem of course. Most other parking companies needed to lie to POPLA and the courts to justify their charges. Some were quite outrageous in their lies. Excel Parking, for instance produced different breakdowns almost every month. When POPLA rejected each one, they would brazenly submit a completely different breakdown the next time. Sometimes a parking company would win a POPLA appeal when a new POPLA assessor made a mistake because they did not yet understand GPEOL. Magically, large numbers of parking companies would then produce identical breakdowns, and would all be hopping mad when the flaws were pointed out and subsequent appeals upheld. The lead assessor of POPLA, Henry Greenslade, decided to publish a document explaining to parking companies in general terms what was, and was not an allowable head of cost. In a respectable industry, the parking companies would have taken his comments on board and lowered their parking charges until they matched the costs he listed. Sadly, they took a different approach and artificially inflated those heads of costs Mr Geenslade listed to match the level of their charges. They were quite blatant about this, and were happy to submit evidence to POPLA with quite different values for the same heads of costs submitted previously. The British Parking Association ran courses for parking operators on how to fudge their evidence to get appeals rejected by POPLA. Although members of the public asked to attend the course to ensure fair play, they were refused. The DVLA were asked by motorists to attend, but declined. Hear no evil. It was notable that following the courses the number of fake pre-estimate of loss calculations submitted to POPLA proliferated, but as they were all based on false premises it did the operators no good, and the charges were rejected. The industry was now in turmoil. For two years parking charges had been proven time and again to not be a genuine pre-estimate of loss, and pressure was growing for the DVLA, Trading Standards and other bodies to take action to curb the rogue practices. The DVLA resisted this - they were raking in huge amounts of cash from the parking companies, and the bonuses of senior members of staff depended on not rocking the boat. A solution had to be found. If the levels of parking charge could not be justified by law, then the law had to change. An opportunity finally arose when a senior judge, HHJ Moloney, became alarmed at the number of parking cases in his jurisdiction. Although the BPA had promised government that POFA 2012 would cut the number of parking cases going to court and save the Ministry of Justice money, in fact it had the opposite effect and cases increased from 845 in 2011 to 35,000 in 2014. HHJ Moloney stated he wanted to find a way of striking out motorist's claims so that judges could automatically rule for parking companies and clear the court backlog and so he arranged a test case, for 2 simultaneous claims; ParkingEye v Beavis and Wardley. ParkingEye engaged Jonathan Kirk QC to represent them. He was unable to attend the first hearing, but luckily for ParkingEye somebody made a hoax phone call and the first hearing was stayed. The hoaxer had intimate information about the case, enough to fool ParkingEye's substitute counsel ('that David Altaras') that he was ParkingEye's employee Alex Cooke. HHJ Moloney ordered a police investigation into the hoax call. The Prankster has been informed that the phone used to make the call was traced and was purchased using the credit card of a senior ParkingEye employee. The employee was captured on video in the shop. However The Prankster has been unable to verify this and calls on ParkingEye to make public the police report to clear the air. As Jonathan Kirk's chambers were involved in helping ParkingEye employees investigated by police in this affair, The Prankster alternatively calls on Jonathan Kirk's chambers to come clean. In the next hearing, Jonathan Kirk wisely decided not to perjure himself and instead of trying to claim ParkingEye's costs were £85 per ticket, he admitted they made no loss at all. In order to justify the charge, he therefore claimed 'commercial justification', a meaningless phrase that can be used to justify anything. As a side issue, Jonathan Kirk QC also presented an over-redacted contract to the judge which hid the fact that ParkingEye were acting as agents. This resulted in the judge incorrectly ruling ParkingEye were acting as principal and so upholding the charge against Mr Wardley, even though the true principal had ordered ParkingEye to drop the charge. Meanwhile, back with commercial justification, never before had this been used in consumer contracts where the contact was imposed on the consumer- only in situations where highly qualified lawyers for each party had equal bargaining powers. Commercial justification cases were also generally about small extra amounts, such as a 1.5% bank charge. They had never been used to justify the entire amount. Nevertheless, this was the only argument put forward by the claimant and so HHJ Moloney was forced to accept it if he wanted to clear the court backlog. He ruled that the charge was a deterrent and a penalty, but that it was commercially justified nevertheless. Mr Wardley decided not to appeal, but Mr Beavis did, and he was fast tracked to the court of appeal, missing out the small claims appeal stage. If ParkingEye expected things to change they were in for a disappointment. POPLA still rejected all their claims because the Moloney judgment was a small claims case and not binding. ParkingEye had more success in court, where a number of judges did not look too closely at Moloney's reasoning and rubber stamped cases through for ParkingEye. Others were more sceptical and stayed cases to await the Court of Appeal verdict. The Court of Appeal recognised the flaws in Moloney's reasoning, and quietly retired the commercial justification reasoning. 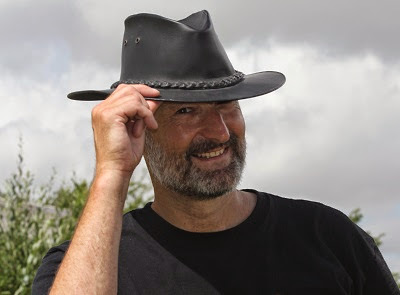 However, they swallowed Jonathan Kirk's assertions that problems would arise if ParkingEye were not present hook, line and sinker, even though absolutely no evidence was presented to support this. They invented a new category of allowable penalty, social justification. Troubled by their own decision, they instantly granted leave to appeal to the Supreme Court, something which is quite rare. Mr Beavis raised the necessary £6,000+ using crowdfunding in one day, which brings us to where we are now. The Prankster has shown that Mr Kirk's arguments are deeply flawed, often have no basis in fact, and have no evidence to support the more outrageous assertions. Carmageddon beckons? Not. The question now is whether the Supreme Court will agree or not; whether a deterrent can be set to an arbitrary level, even though a lower level has been proved to work; what level of profit should the courts allow in a 'pre-estimate of loss'? It should be noted that ParkingEye's projected profits for last year are over 30%, and these are entirely funded by parking charges, although they are not officially due to be revealed until September. What will the Supreme Court rule? Time will tell. Moloney's attempt to cut court lists failed and there are now more hearings than ever before due to the law of unintended consequences. If the Supreme Court rule in ParkingEye's favour we can expect even more clams; a feeding frenzy of claims going back 6 years would not be out of the question.